Salamanders are peculiar creatures. Colorful and scaleless amphibians, they live the water and on land throughout North and South America. Some salamanders live in caves, while others live mostly underground. Not all salamanders look the same. 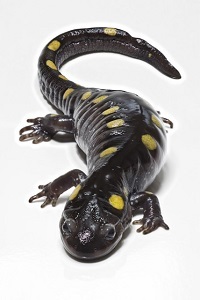 The tiger salamander has a stout body, broad head, and small eyes. The tiger salamander eats worms and other salamanders. The Texas blind salamander has skinny legs, and tiny eyes on its ghostly pale body. It eats the droppings left by bats. The axolotl salamander is named after the Aztec word meaning “water monster.” It lives in Xochilco Lake in Mexico. Not all salamanders look the same. The axolotl salamander has feathery ears and skinny feet. The red salamander has a fat body, short legs, and a short tail. The red salamander eats earth worms, insects and smaller salamanders. The spotted salamander has spots on its back. The spotted salamander eats slugs and worms. Taking the example of their diets alone, you can see that salamanders are varied and interesting creatures.